If you’ve been putting up with a drafty patio door that sticks, fogs up or leaks during a heavy rainstorm, it’s time to consider a new, energy-efficient replacement. Well-crafted doors make a beautiful entrance to the outdoors and a spectacular view from the inside. 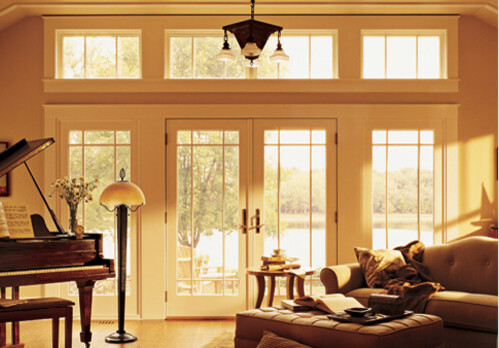 Better yet, create a stunning wall of light from your patio when you combine patio doors with replacement windows. Because patio doors come in contact with the ground and are often opened many times each day, our patio doors are designed for the long-term, with easy operation even in the toughest of climates. With continuous weatherstripping and interlocking design features, they help keep your home draft-free and provide energy savings too. They also offer multiple locking points for an added level of security. Hinged French doors provide easy access to your home’s exterior or patio. Traditional craftsmanship combines with modern energy efficient technology to create this modern classic. Mulit-point locking systems improves energy efficiency and offers an increased level of security. There are even French outswing patio doors and a space saving sliding French patio door version to this traditional styling. Andersen redefined the traditional French patio door category with the introduction of the revolutionary Frenchwood® sliding patio door. This sliding French patio door combines the traditional styling of French doors with the space- saving convenience of a sliding patio door—adding a beautiful touch to your home. Save space with sliding doors. The sleek, contemporary sliding door design allows for maximum glass area, and is engineered for smooth gliding, secure performance. Sliding patio doors may feature a stainable interior. Modern sliding patio doors have a low-maintenance, rigid surface that protects the interior of your home.